The client wished for a totally new modern kitchen that reflected their lifestyle. The final design involved removing a load-bearing wall between the original kitchen and dining area, a new kitchen ceiling, a new redesigned kitchen window, a new entrance to a home theater suite and the addition of a small pantry. The design was informed by a concept that alluded to the clients’ professions in the entertainment industry. 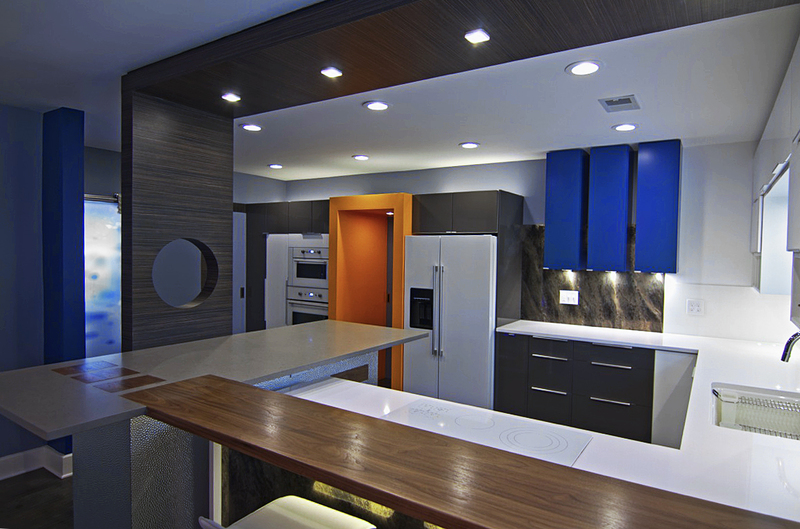 Cabinets and appliance form and colors were used unconventionally to reflect the concept. The wall was replaced by a custom bar island that was designed to create a visual boundary/entrance to the kitchen area, once again informed by the concept, it brought together a variety of modern Eco-friendly materials. The pantry glass barn door was customized by laminating a graphic image of melted celluloid film back lit by an existing window in the space. Dimmable LED lighting was used throughout.